The Australian Gold Nugget is a gold bullion coin minted by the Perth Mint.They have legal tender status in Australia and are one of few legal tender bullion gold coins to change their design every year, another being the Chinese Gold Panda. 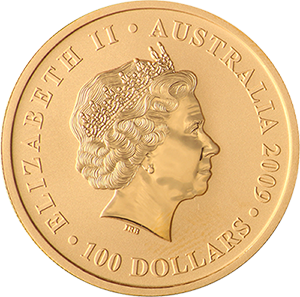 The 1 oz Australian Nugget is one of the world’s premier gold bullion coins. Produced by the globally respected Perth Mint, also known as Gold Corporation, which itself is owned by the Government of Western Australia. It was first released in 1986. The 1 oz Australian Nugget was soon joined by other releases of the coin, the 2 oz, 10 oz and 1 kilo coins in 1991 and smaller denominations of the coin include the 1/20 oz, 1/10 oz, 1/4 oz and 1/2 oz. A 1 tonne Australian Nugget was produced in 2011, breaking the previous record for a gold bullion coin held by the Royal Canadian Mint and is worth A$53m. The 1 oz Australian Nugget has a diameter of 32.10mm and a thickness of 2.65mm, the gold content of which measuring 31.10g. Among the very purest of all gold bullion coins, 24 carats, it has a face value of A$100. The coin’s gold content, and its purity, however, means its true value is much higher. Unlike most coins of such purity, the Australian Nugget is not so malleable as to need extremely careful handling. This is due to the fact that the coin is covered in a hard-plastic coating, which, along with the coin’s two-tone effect, gives the coin its unique sheen. Another aspect of the coin’s aesthetic value and collectability is its design. Changed yearly, it is almost unique among the world’s best selling gold bullion coins, with only the Chinese Panda constantly redesigning the product. Despite these changes, the coin always represents the figurehead of Queen Elizabeth II on its obverse. 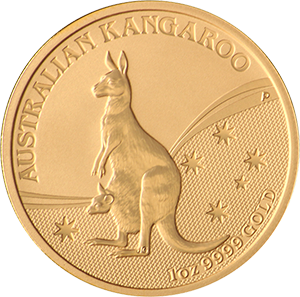 The coin’s inverse first depicted a gold nugget (giving the coin its name) until 1989, when the iconic kangaroo was first introduced, different designs of which are present to this day. They are sometimes referred to as Gold Kangaroos as a result.